GSM wireless Wide Area Network (WAN) gateway/router, provides an alternative to traditional wired TCP/IP, utilizing wireless GSM GPRS/EDGE technology to create primary and backup network connectivity. 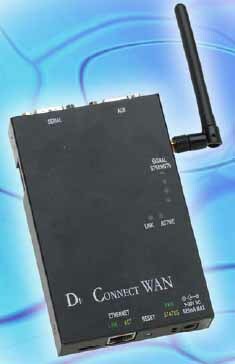 Di Connect WAN GSM, a wireless Wide Area Network (WAN) gateway/router, provides an alternative to traditional wired TCP/IP, utilizing wireless GSM technology to create primary and backup network connectivity. Part of Di’s remote device management focus, Digi Connect WAN GSM offers an easy and cost-effective means of connecting virtually any remote location or device into the corporate IP network. It is ideal for use where wired networks (e.g., lease line/frame relay, CSU/DSU, fractional T1) are not feasible or where alternative network connections are required. With a General Packet Radio Service (GPRS) class 12 and Enhanced Data Rates for GSM Evolution (EDGE) class 10 wireless interface, Di Connect WAN GSM provides data rates up to 240 Kbps (100-130 Kbps typical). 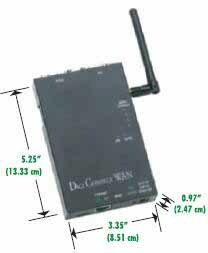 Benefits of wireless communications via Di Connect WAN GSM include instant deployment, elimination of wiring costs, elimination of problems due to wire breaks, the ability to traverse firewalls, and the flexibility to move the connection virtually anywhere. Plus, by using the unique Di SureLink “always on” functionality, users can keep a connection alive via device or server initiated settings which enable quick communications when you need it. For backup network and device applications, Di Connect WAN GSM integrates with remote locations via a secondary Ethernet WAN port on an existing router. This provides a truly diverse network connection for remote locations requiring maximum uptime, such as retail/POS and financial applications. 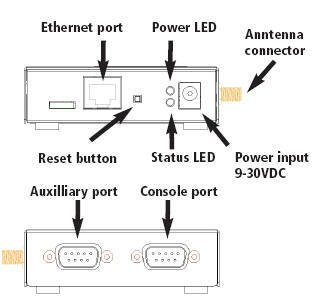 Di Connect WAN GSM can also provide the primary network connection for remote sites with individual devices or small networks of IP devices. New construction locations, power utility substations, small retail sites or temporary facilities without primary wired connections are examples of applications for this wireless connectivity solution. Di Connect WAN GSM seamlessly integrates with the Di Connectware™ Suite, which provides easy setup, configuration and maintenance of large installations. Users can upgrade firmware or change settings on thousands of devices with only a few clicks. It also makes troubleshooting simple by reporting problems like identifying rogue devices or network issues.